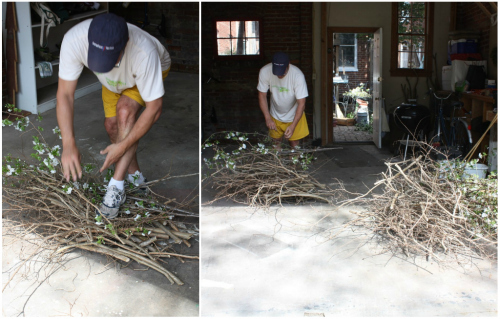 The warm season down this way has really lent to working on outdoor projects. 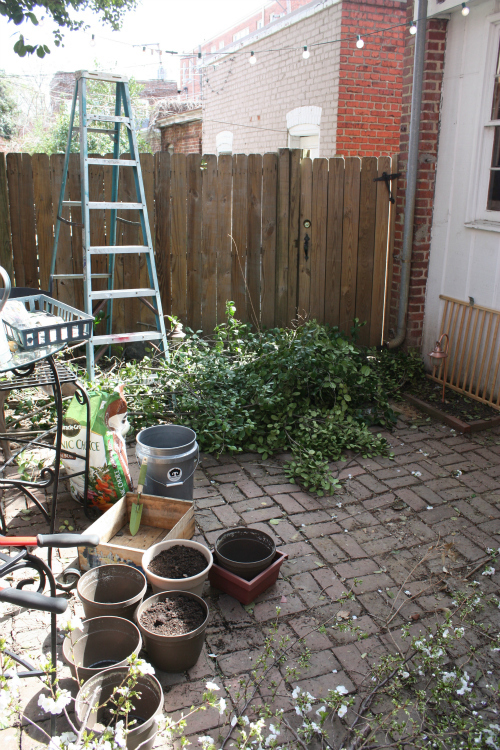 Each weekend we've been trying to chip away as we can on getting our back patio space maintained and in shape for the growing season. 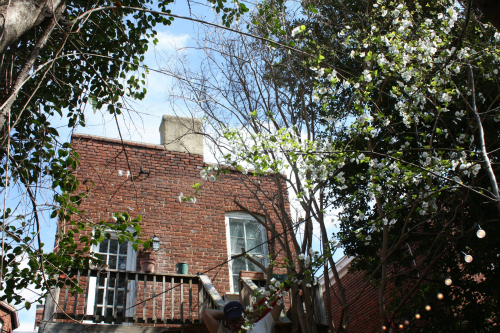 We have 3 full size trees forming a triangle in our back patio space: a holly tree, a crape myrtle, and a third flowering tree we need your help identifying! Each of these 3 trees have grown tall enough past our second story that they've come together in the center of the triangle and provide a canopy of shade over our entire patio. 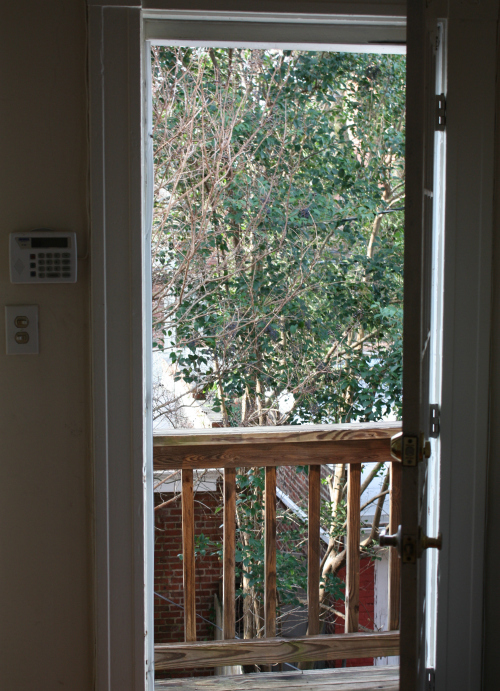 When looking out back from our second floor, you can see the tops of the trees. While the idea of a natural shade canopy is nice, the branches have intermingled enough that they are tangling among one another and getting caught up in the electrical cables that run from the back of our house. 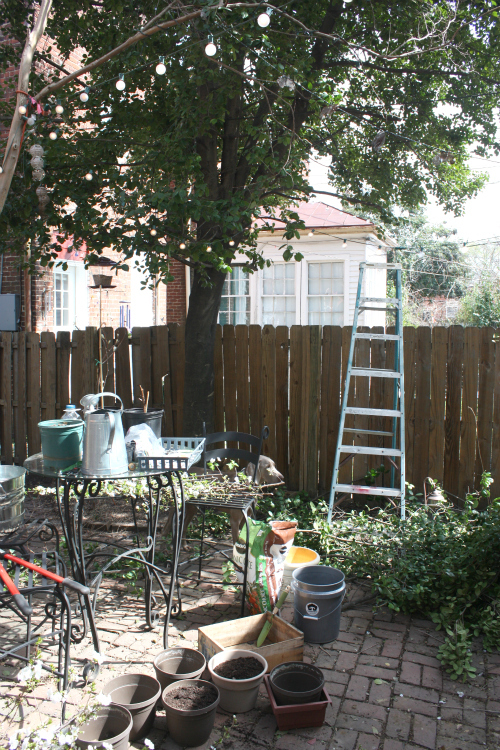 We're also interested in having a few key areas of the back patio open to full sun for gardening purposes. All of this is to set up our reasons for heavy trimming of the trees this spring. 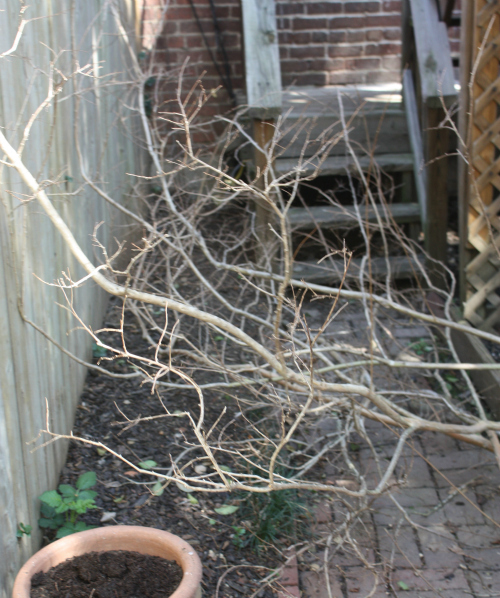 We'd really like to get them trimmed to a point where we can simply prune them with regular maintenance moving forward. 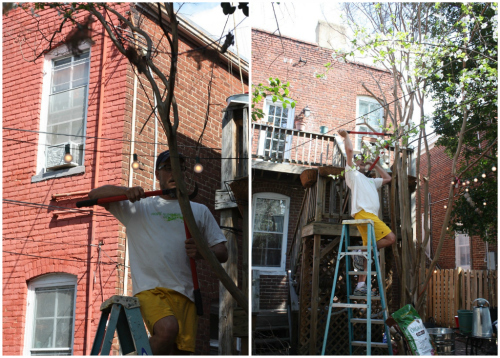 The major trimming is probably going to take a few weekends since the trees are so tall and hard to maneuver, but we've made some great progress so far (with the help of our neighbor, Alice's ladder). 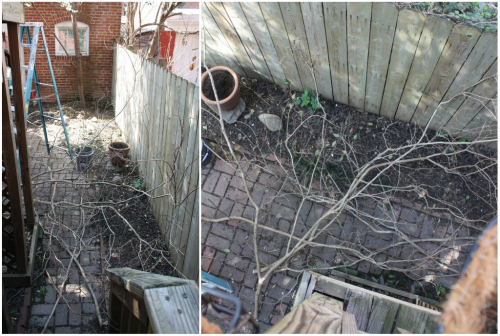 This is what we're going for — trimming back enough growth to allow for full sun in key areas of the backyard while maintaining some shady areas and the natural feel of the barriers in our back patio. Side note: the back space can tend to look crazy like this on any given weekend, with planters, potting soil and tree trimmings scattered about. 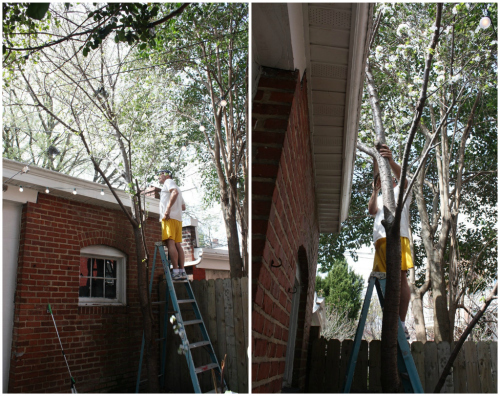 We also decided to trim up and hold onto several of the thicker leftover crape myrtle branches we trimmed. We're not sure what we'll do with them but we thought it was generally a good idea. 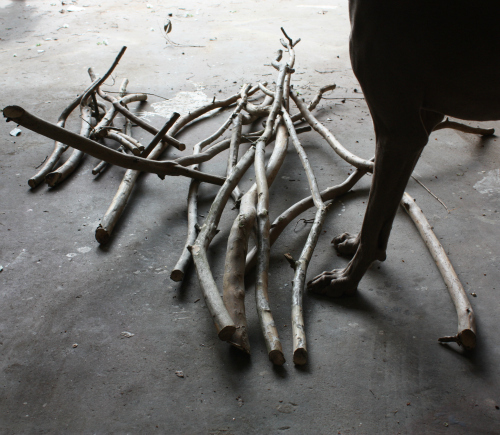 We're thinking we'll have more ideas for diy garden supports or other areas we can use them down the road. 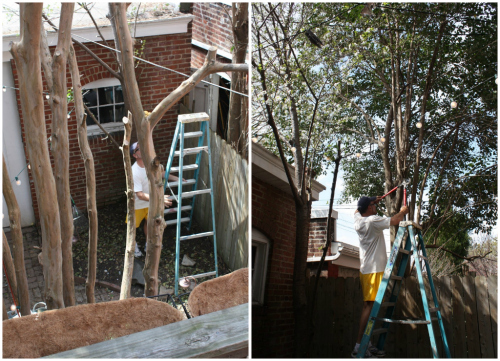 All in all, our #1 goal was to clear branches away that were either already caught up in cable wires or headed that way fast. 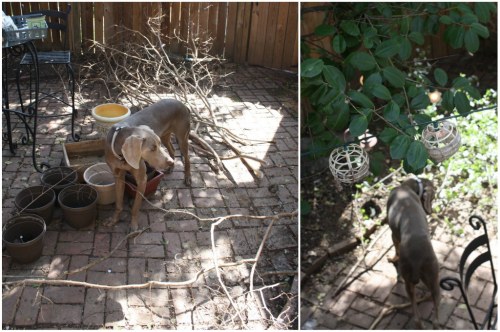 Our #2 priority was clearing enough of a "hole" in the shade barrier to allow for full sun in at least one area of the patio. 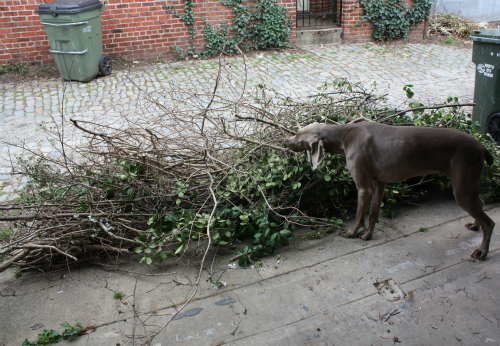 Last but not least, #3 on the list is to continue a heavy trim on each of the 3 trees this year so we can simply maintain and properly prune in seasons to come. 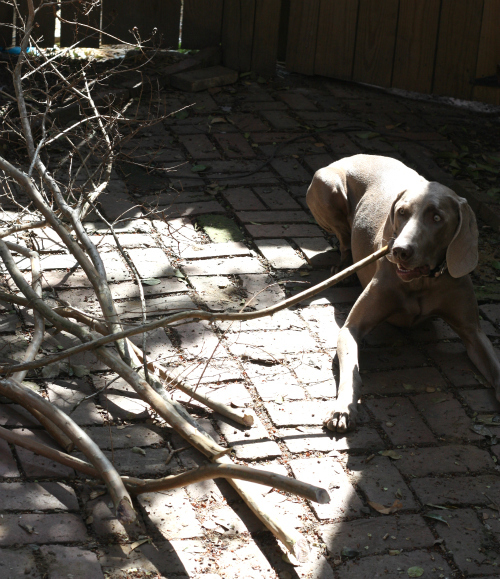 I can see Basil was a really big help with the tree trimming, guarding those fallen branches so that no one stole them away! 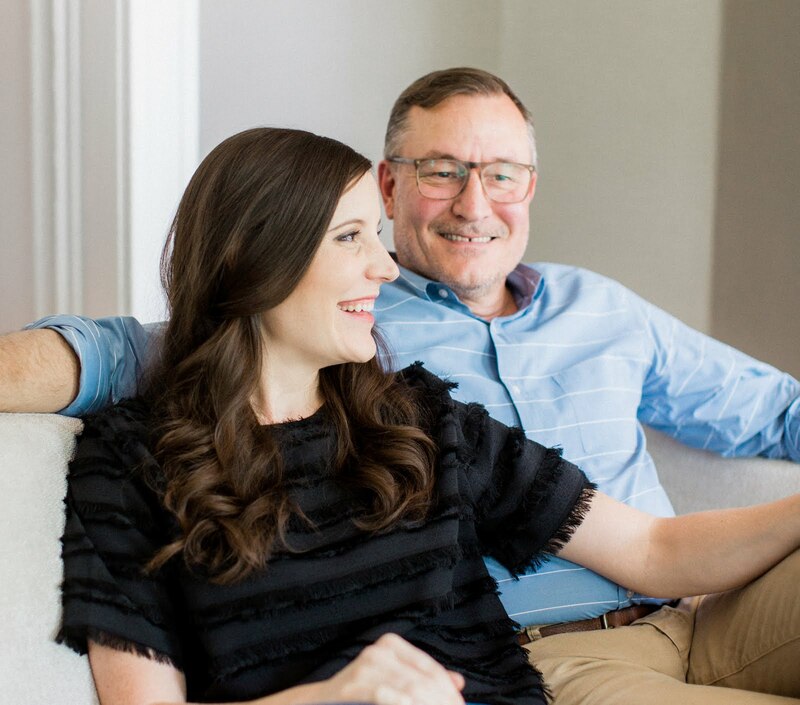 Good to this interesting information here.